I am about to make your Tuesday. Get ready. One of Dan’s favorite indulgences are the cinnamon crunch scones at Panera Bread. And I have to admit, he’s onto something. Their scones are almost muffin like. So crumbly and soft. No hard hockey puck scones in sight at Panera! The cinnamon crunch one, in particular, is something special. 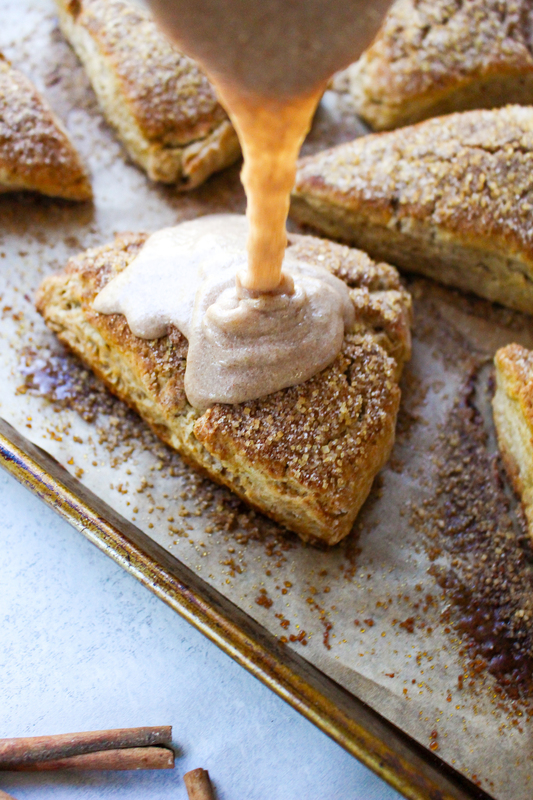 The dough is studded with cinnamon chips and then everything is topped off with the most decadent cinnamon glaze. They are a tiny slice of heaven when consumed with hot cup of coffee or tea. Just sayin’. We took Kieran to breakfast there not too long ago, and we picked out a blueberry muffin for him (one of his faves), and Dan got himself the scone. Kieran saw the scone and wanted nothing to do with his muffin. He devoured all of Dan’s scone, much to my husband’s dismay. #parenthood Don’t worry for Dan, though, because he hurried up to the counter and promptly ordered himself another one. It’s easy to see why! 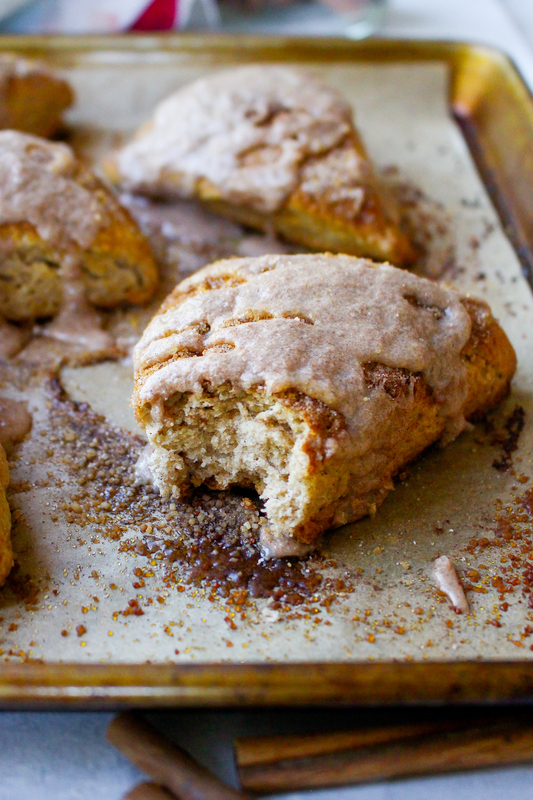 They are freakishly delicious, and I’m not even a huge scone person. 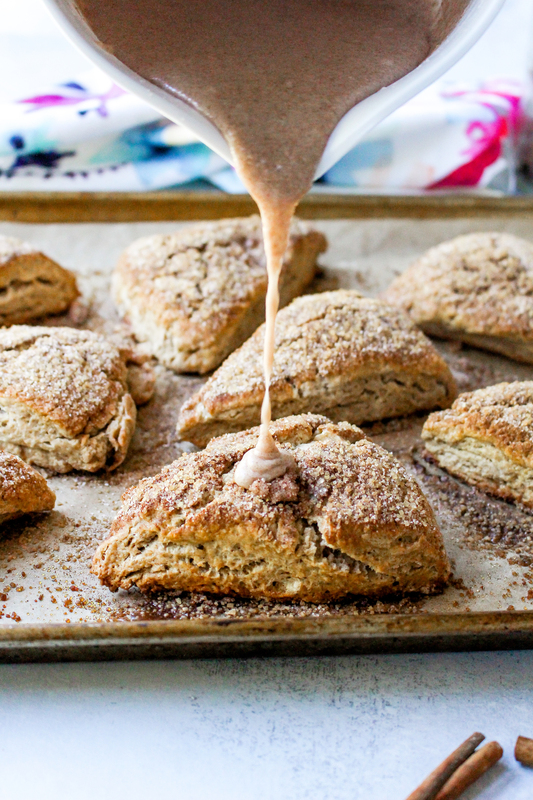 I love a GOOD scone, and by that I mean one that is crumbly, soft, and…dare I say…MOIST (sorry). A crunchy sugar or glaze topping earns bonus points in my book. Many scones, however, do not live up to these expectations. Most are dry and dense and lacking flavor. If I am going to justify a hunk of carbs for breakfast, you better believe I want that hunk of carbs to be fabulous. And these hunks of carbs (OK, last time I say that. Promise.) are just that. Freaking fabulous. 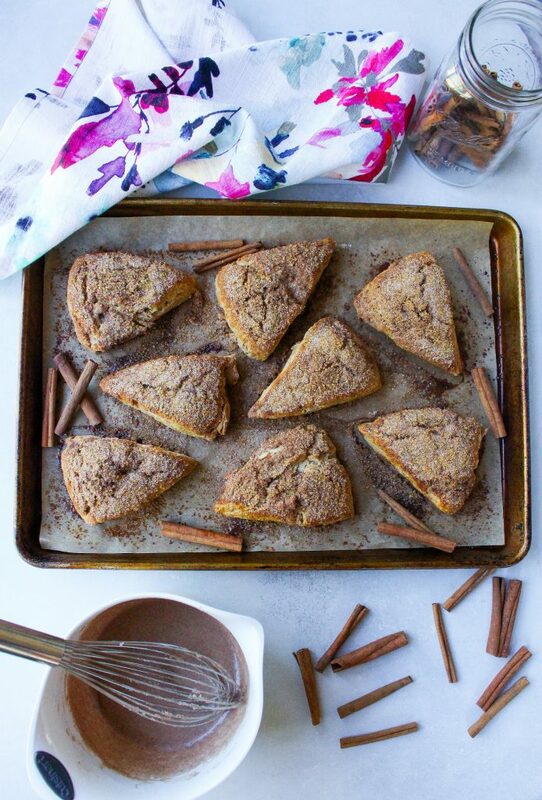 While I won’t go so far as to say they live up the perfection of Panera Bread’s cinnamon crunch scones, I will say that they are a close second. 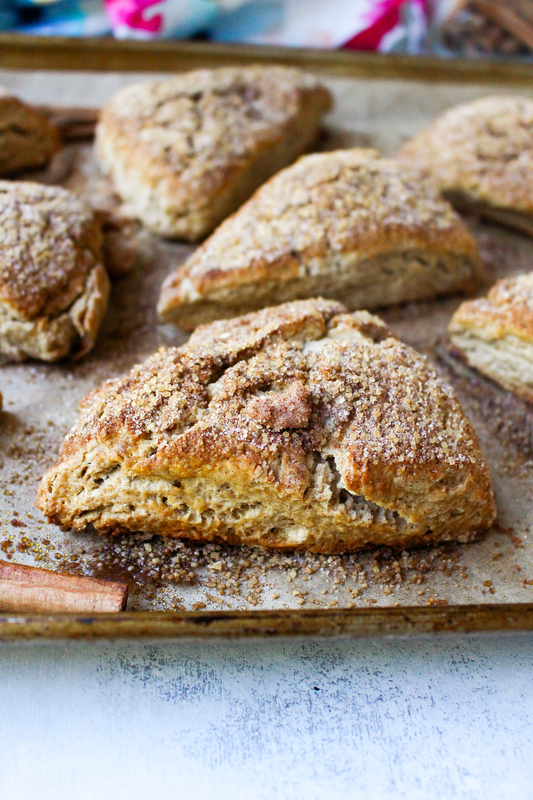 No dense, dry scones here! 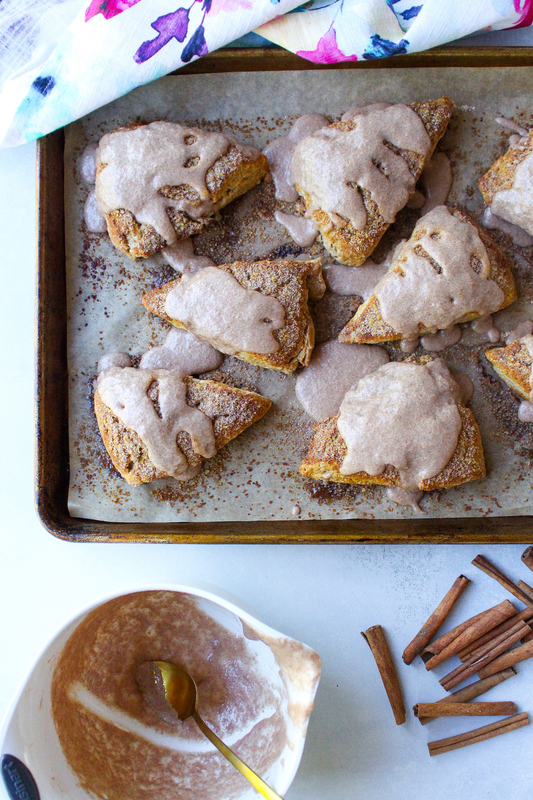 Just soft and crumbly, sweet and cinnamon-y goodness. I add cinnamon chips to my cream scone batter and load them up with a ton of crunchy cinnamon sugar topping. Once they’re baked, I generously (!!!) 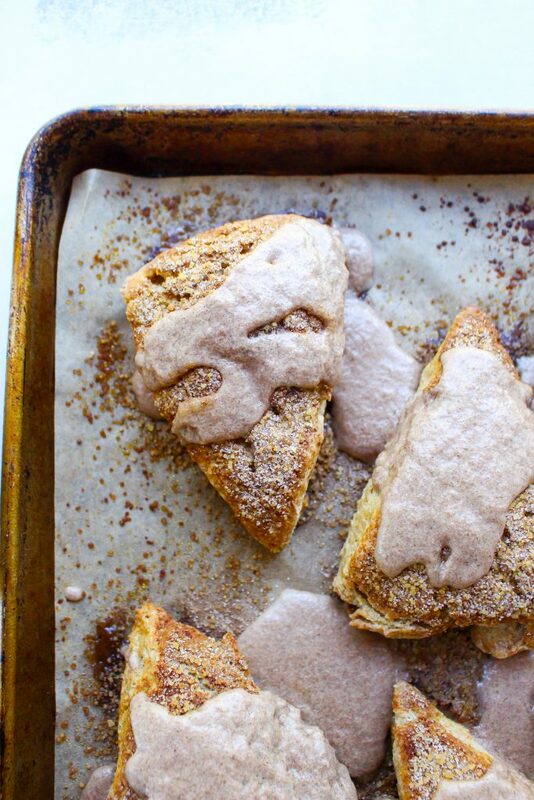 pour the sweet cinnamon glaze over top, letting it cascade over the sides in a lovely haphazard way. It’s how it should be done. 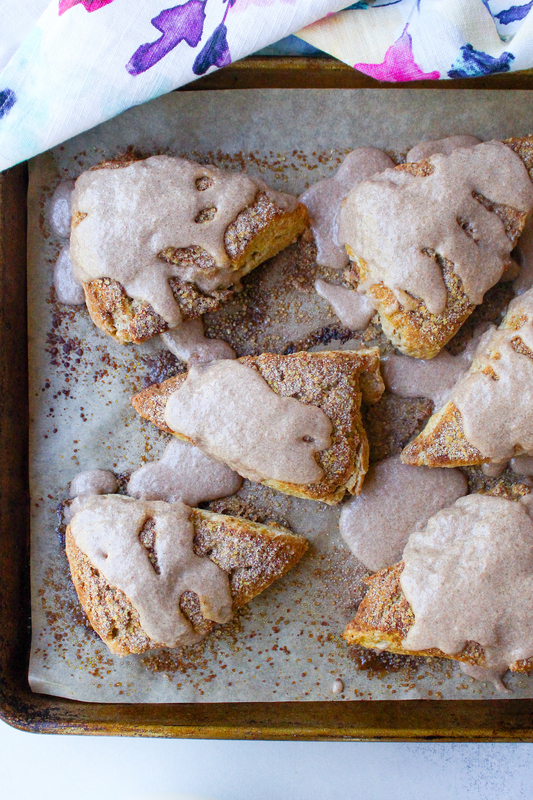 Scones are meant to be comforting and homey. No need to worry about making everything perfect here. I have to say, the more I make scones, the better I get at the process. They get fluffier and moister with each batch! My first inclination is to mix the heck out of batters, and I’m learning that this approach just doesn’t work for most baked goods. Scones especially. In fact, the LESS you work this batter, the better. I use my food processor to get everything incorporated, but I pulse the machine just a couple times to get all the ingredients to come together. Any more than that, and you’ll end up with those hockey puck scones we all want to avoid. I stirred in the cinnamon chips by hand and very, very gently formed the dough into a disc. It was crumbly and messy and gave me a burst of anxiety (as these things almost always do), but that’s what you want! A barely formed dough. You want it to just hold together enough so you can form it into shapes that make sense, hah. How’s that for the most vague recipe instructions you’ve ever seen? But really. The more you think about it, the more likely you are to have dense scones. The freeform way is the best way here. It goes against all my natural tendencies, but it works. Trust me. While I was making and then styling/photographing these, Kieran came into the kitchen to “help.” Which translates to “stick my hands where they don’t belong!” But it’s all good. As he gets older, he’s getting more and more interested in what I’m doing in the kitchen, and I’m thrilled to have a little helper. I’m trying to embrace the mess and leave my “crazy” behind. Because this is what it’s all about, folks! Oh, and for the record, these scones are also completely Kieran approved. Preheat oven to 400°F. Line a baking sheet with parchment paper. In the bowl of a stand mixer fitted with the paddle attachment, combine flour, cinnamon, butter, sugar, baking powder, and salt. Mix on low for a minute or so or until the mixture resembles wet sand. In a separate bowl, whisk together the cream, eggs, and vanilla. Add the cream mixture to the flour mixture, and beat on low speed until just incorporated. 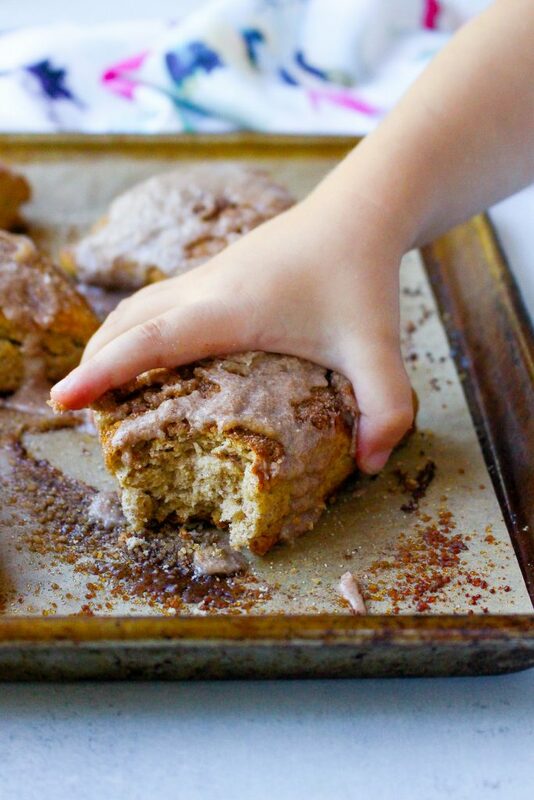 Stir the cinnamon chips into the dough by hand. Turn the dough out onto a lightly floured work surface, and form it into a flat disc, about 8 inches in diameter and 2 inches thick. Cut into 8 wedges and transfer to the prepared baking sheet. Brush the scones with egg wash. In a small bowl, whisk together the two sugars and the cinnamon. Sprinkle it liberally over the tops of the scones. Bake until the tops are golden brown and firm, 30-35 minutes. Cool on wire racks. 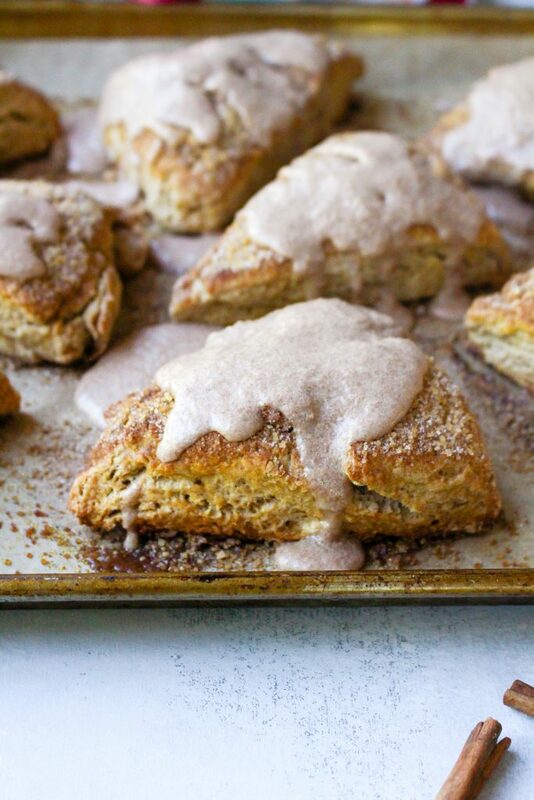 Whisk together the vanilla, cinnamon, powdered sugar, and a splash of milk until a smooth, creamy glaze forms. Thin the glaze out with another splash of milk, if needed, to achieve a drizzling consistency. Drizzle the glaze liberally over the cooled scones. They look REALLY lovely and tempting! Congrats.